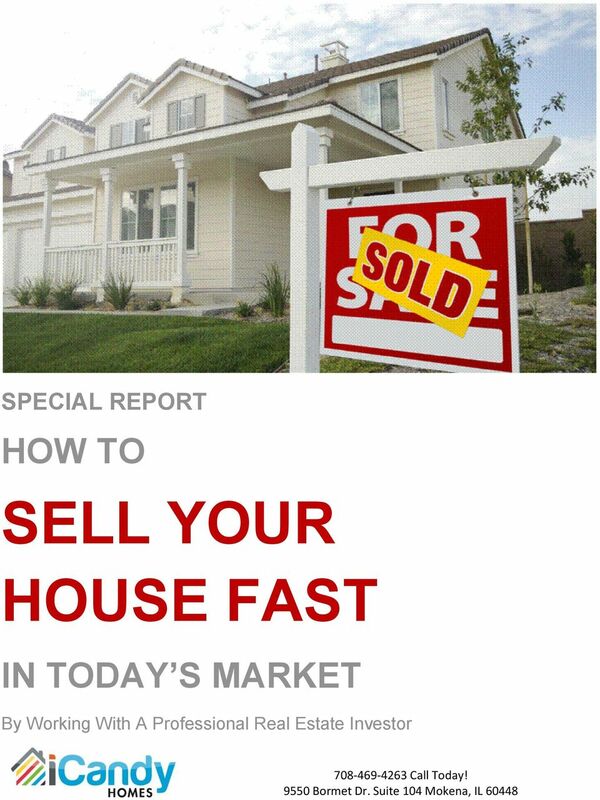 Download "SELL YOUR HOUSE FAST HOW TO IN TODAY S MARKET SPECIAL REPORT. By Working With A Professional Real Estate Investor"
4 ownership of your home. Cash offers equal no banks or lending involved! 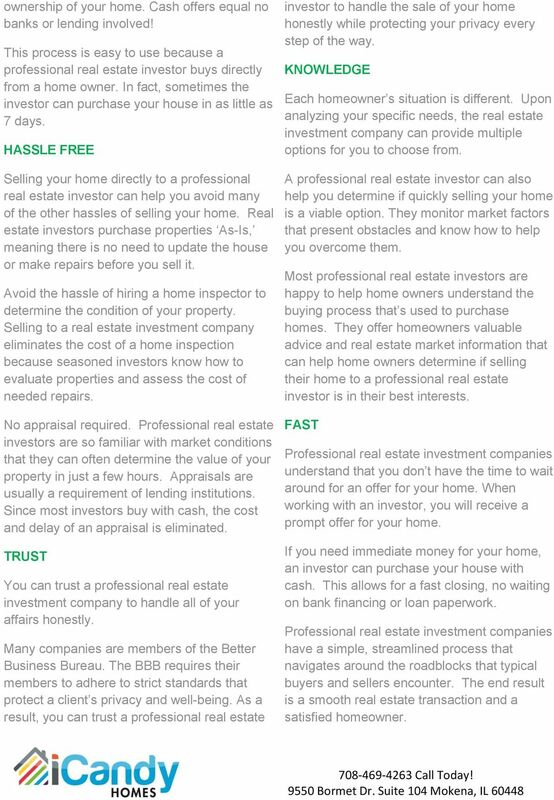 This process is easy to use because a professional real estate investor buys directly from a home owner. In fact, sometimes the investor can purchase your house in as little as 7 days. HASSLE FREE Selling your home directly to a professional real estate investor can help you avoid many of the other hassles of selling your home. Real estate investors purchase properties As-Is, meaning there is no need to update the house or make repairs before you sell it. Avoid the hassle of hiring a home inspector to determine the condition of your property. Selling to a real estate investment company eliminates the cost of a home inspection because seasoned investors know how to evaluate properties and assess the cost of needed repairs. No appraisal required. Professional real estate investors are so familiar with market conditions that they can often determine the value of your property in just a few hours. Appraisals are usually a requirement of lending institutions. Since most investors buy with cash, the cost and delay of an appraisal is eliminated. TRUST You can trust a professional real estate investment company to handle all of your affairs honestly. Many companies are members of the Better Business Bureau. The BBB requires their members to adhere to strict standards that protect a client s privacy and well-being. As a result, you can trust a professional real estate investor to handle the sale of your home honestly while protecting your privacy every step of the way. KNOWLEDGE Each homeowner s situation is different. Upon analyzing your specific needs, the real estate investment company can provide multiple options for you to choose from. A professional real estate investor can also help you determine if quickly selling your home is a viable option. They monitor market factors that present obstacles and know how to help you overcome them. Most professional real estate investors are happy to help home owners understand the buying process that s used to purchase homes. They offer homeowners valuable advice and real estate market information that can help home owners determine if selling their home to a professional real estate investor is in their best interests. FAST Professional real estate investment companies understand that you don t have the time to wait around for an offer for your home. When working with an investor, you will receive a prompt offer for your home. If you need immediate money for your home, an investor can purchase your house with cash. This allows for a fast closing, no waiting on bank financing or loan paperwork. Professional real estate investment companies have a simple, streamlined process that navigates around the roadblocks that typical buyers and sellers encounter. The end result is a smooth real estate transaction and a satisfied homeowner. 5 Want to use a realtor to sell your home? Many homeowners prefer to hire a realtor to represent them, advertise their property and handle the selling process. This may be because time is not a factor in selling their house, so they are willing to wait a few months for a higher priced offer. You will need to improve your home s appearance so you attract qualified buyers. Here are some helpful tips if you plan to use a realtor to sell your house. 1) Get rid of unnecessary clutter. Most of us have lots of unwanted clothes, furniture and knickknacks that clutter our home. Keeping these items around makes your home harder to sell because most people think it detracts from a home s appearance. Be sure to get rid of any unwanted clothes, furniture and other items that clutter your home before you sell your home. You could have a yard sale for your unwanted items and donating the items to worthwhile charities. 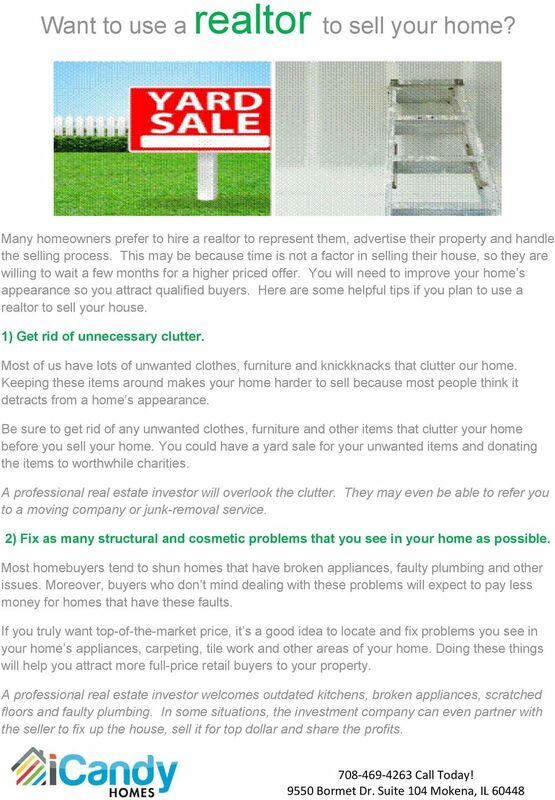 A professional real estate investor will overlook the clutter. They may even be able to refer you to a moving company or junk-removal service. 2) Fix as many structural and cosmetic problems that you see in your home as possible. Most homebuyers tend to shun homes that have broken appliances, faulty plumbing and other issues. Moreover, buyers who don t mind dealing with these problems will expect to pay less money for homes that have these faults. If you truly want top-of-the-market price, it s a good idea to locate and fix problems you see in your home s appliances, carpeting, tile work and other areas of your home. Doing these things will help you attract more full-price retail buyers to your property. A professional real estate investor welcomes outdated kitchens, broken appliances, scratched floors and faulty plumbing. 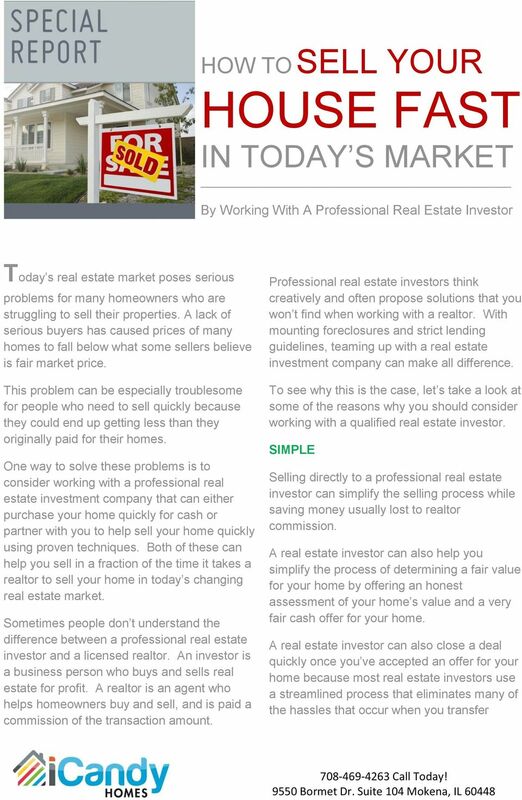 In some situations, the investment company can even partner with the seller to fix up the house, sell it for top dollar and share the profits. 6 3) Curb appeal Many homeowners tend to forget about the appearance of their home s porch, yard and exterior. This forgetfulness can make selling your home a nightmare because most people are turned off by homes that have an unkempt appearance on the outside. This problem can be prevented by making sure your property has curb appeal before you sell your home. The best way to make sure your home s exterior is in good shape is to locate and fix any problems you see in your home s siding, shingles or exterior paintwork. You may also want to improve the look of your home s yard by removing weeds and planting new shrubbery around the front of the house. Doing these things can add value to your home because they improve the appearance of your home s primary focal points that are seen when a potential home buyer sees your home for the first time. Big tip: Cut the neighbor s grass if you need to. Don t give buyers an excuse not to buy because they think the next-door-neighbor is a slob. A professional real estate investor doesn t mind the outside appearance of your home. Are your shingles starting to curl? No problem. The bushes overgrown? Not an issue. 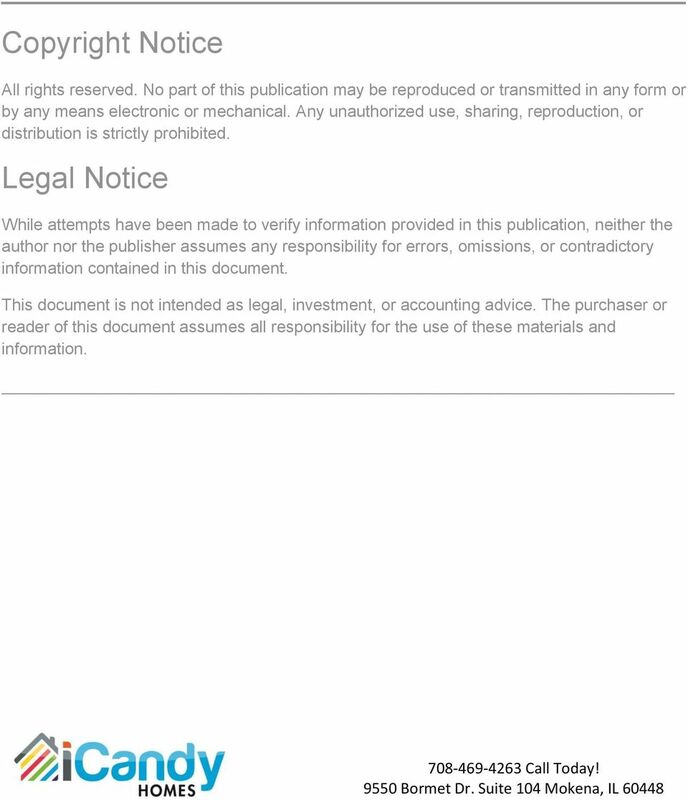 All of those fixes are calculated into the no-obligation offer to purchase your property. 4) Finally, it s a good idea to redecorate your home before you sell it. Redecorating your home will help potential buyers determine what it would be like to live in your home. As a result, you may want to replace items such as curtains and furniture with different items that can help you demonstrate to potential home buyers what living in your home would feel like. A professional real estate investor is not deterred by what your furniture looks like. Investors can envision a clean, neutral house no matter how the house is decorated. 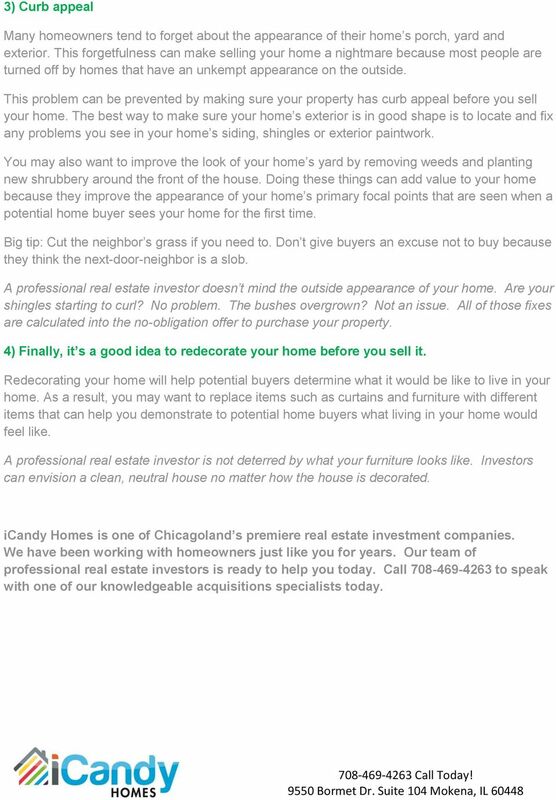 icandy Homes is one of Chicagoland s premiere real estate investment companies. We have been working with homeowners just like you for years. Our team of professional real estate investors is ready to help you today. Call to speak with one of our knowledgeable acquisitions specialists today. What Homebuyers Should Know About Their. Appraisal. A Public Service of. Maryland Association of Appraisers, Inc.
HOME BUYING PROGRAM John Burchell Real Estate Investments, Management and Renovations Page 1 of 14 Who WE Are: We are a multi service company who has the ability to BUY, REPAIR, MARKET, and SELL HOMES.